Seems that some one hasn’t got enough of Toyota’s Etios sedan in India. Well that someone happens to be yours truly. No wonder, I am a Toyota fan and had even done a project about the company for my part time MBA course. Since I was staring down a long weekend, I decided that the best part would be to go in for a test ride of the same and then satiate myself. Gosh! I wish that some one raises my salary so that I could afford the Toyota Etios in my drive. So off I went to Millenium Toyota(it was actually the other way round since the show room got the car at my doorstep for the test drive). Remember, just the other day, I had visited them for writing on a review of the Toyota Corolla Altis. So I am out on the roads again with the familiar Toyota Etios. The looks of the car have actually grown on me. Overall, I am now enamored by the looks of this car. 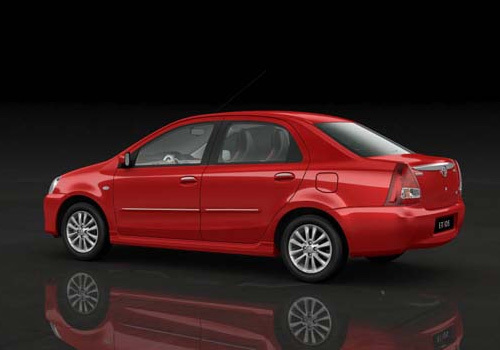 The Toyota Etios in India is a mature design and would age as gracefully as the Mitsubishi Lancer from yore. The single wiper blade doing duties has become a style symbol now. The conservative approach by Toyota Kirloskar Motors is very evident in all of the design elements. The car especially gets the front grille treatment which is going to become a family face soon for the company as a whole. 15 inch alloy wheels ensure that the car is kitted with goodies unlike the Mahindra Renault Logan. The darkened part of the head lamps does imbibe a sporty look but then that is it. It would be ideal to say that this is a smaller Corolla in the making. The rear shows a much better add-on boot design than the Mahindra Logan. Moreover, if we Indians can accept the Suzuki Dzire here, we definitely can adjust with the Etios look. Speaking of the boot, it is 595 liters and one of the biggest rumps seen on an entry level car. Open the boot lid and you would be aghast at the quality of the boot cover. It doesn’t look like a Toyota product at all. All the sealing are visible to the naked eye, something which even the Suzuki Dzire conceals well. The interiors also have that typically cost cutting thing going on. The test drive of the Toyota Etios in India however revealed that this vehicle can stand the test of time easily. Since it was a test car, it had been driven by customers of varying driving skills and over different terrains. There was not a single plastic which had fallen apart or any other thing. The red lining for the seats also had the same luster that I had noted in my review of this car. The AC still worked fine but the blower was a bit noisy. The chilled glove box did keep my cola chilled till the end of the drive(yes, I was very thirsty and had to stop by at a cold drinks shop during the test drive). 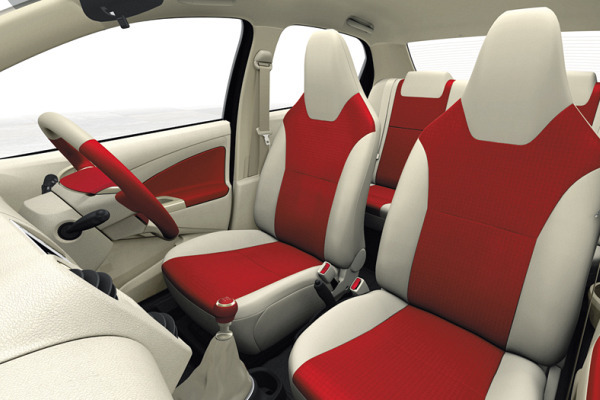 The best part is that even though the interiors may not feel typical Toyota, they have the durable quality feel. Moreover, the seats, especially the front ones were comfortable but then a bit upright. This would may be cause a problem on long drives for tall drivers. The rear seats had a perfectly inclined angle and this makes it one of the best rear seat cars in the entry level segment. No fouling with the front seats or brushing of knees happened while I was seated at the back of the car. This despite the fact that the front seat was pulled to the back. Impressive enough. Loading the boot was also easy since there are no suspension intrusions. There is only a single engine option for the Toyota Etios in India and it is the 1.5 liter petrol one which makes 90 PS @ 5600 rpm and 135 Nm of torque @ 3000 rpm. This is more than enough to hail the sedan from 0-100 kmph in 11.6 seconds, 0.02 seconds faster than the last time I tested it. The transmission is a 5 speed one and has long throws. But then the 930 kgs kerb weight of the sedan is enough to rival some of the big hatchbacks. The car has got short gearing and this means that with some more tuning, it can rival the 1.5 liter Vtec of the Honda City. Braking action was also good and since the test car came with ABS and EBD, it reduces the braking distance significantly. Fuel efficiency is a claimed 17.64kpl in the ARAI driving cycle. This is more than what the Swift Dzire petrol can claim to achieve. As far as safety was concerned, it is kitted with two air bags, the GOA body construction, seat belts and collapsible steering column. Now, time to return the car to the dealership. Hmmm. Am I satisfied with the drive? Yes and No. The reason for the Yes is that this car delivers whatever it has promised. No, because I still want to own this car badly. Can anyone finance the Rs 7 lakhs for me? That is the Toyota Etios price in India and mind you, it is for the top end version. Just let me know. Nice comment. I would like to know which Car is better for a family man whether it is Etios G or Swift Dzire VXI?. I am planning to buy a Sedan within 6 lacks range. After launching Etios, i am bit confused. Please give me your valuable comments. 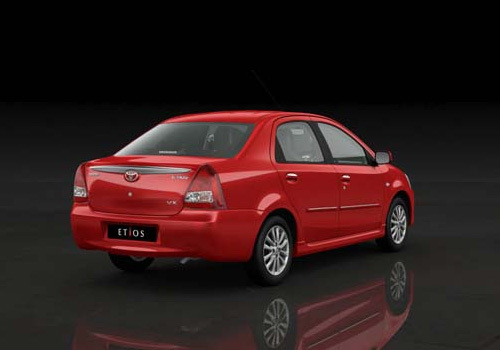 We at Indiandrives would heartily recommend the Toyota Etios. Both the vehicles are good in their own right but then the Toyota is better suited for families. If you are fine with the 5 months waiting period, then it should be the Etios for you. The Swift Dzire also has a 3 months waiting period. Thank you for your reply, I will be going with Toyota Etios G.
Thanks again for your good comments. Lijo, Excellent review. I have booked a Vermillion Red Model V after test driving twice and fairly satisfied. the leg space in the back seat and the boot space is gargantuan!! i surely can use to shift houses without calling a packers or movers!! I bet this is probably the best in its class in the entry level sedan. I am driving Maruti Zen VXi since last 8 years and now want to go for a SEDAN in 7 lacs range. I go on long drives once in a month and want impressive look too. Please suggest with your valueable advice. You can go for the Toyota Etios. It is a wonderful car and has got that legendary Toyota reliability backing it. I have visited toyota showroom and had a veiw of ETIOS. How do you find the same compared to other Sedan. I had been driving Maruti Zen VXi which was very low maintenance. Will the toyota car compete the maintainance cost? Being a Toyota, the maintenance part is supposed to be very low and as all Toyota cars are, utterly reliable. You can put your money on this sedan without any fear. As compared to Etios,Fiesta,Dzire,Manza- which car gives you a good balance,driving comfort,engine swiftness,safety at high speed. All the cars in this category are equally competitive however our bet would be on the Toyota Etios which has good high speed stability, nice pickup and is a safe car as well. When Etios Sedan Diesel will launch? 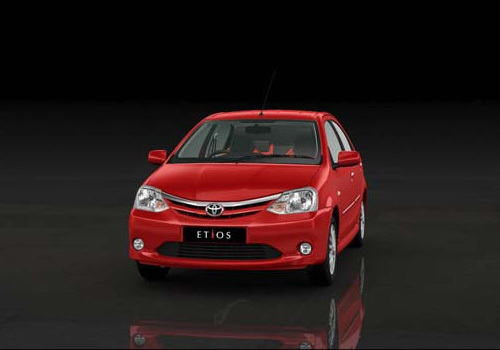 Estimates say that the Etios diesel would be launched towards the end of 2011 or in early 2012. I m looking 4 a sedan variant car within in range of 6lakh is etios is comes within range.suggest me ..
which is the best place or city to drive new toyota etios liva in India?